Here is a split with 2 collaborative tracks between these 2 power electronics artists. The theme is resistance, gorilla armies, political rebels. There’s something about when power electronics artists explore political subjects that I really enjoy. Pogrom is a bit more noisy but also falls into a traditional pe style. It’s pretty generic stuff but well executed so fans of the genre will not be disappointed. Some of the vocal delivery is done quite well and seems to be Pogrom’s strong point. One major issue with the whole disc – yet moreso Body Cargo’s tracks – is that the quality is quite poor. Both project and employ an extremely muddy sound which dulls the edges more than is preferred. 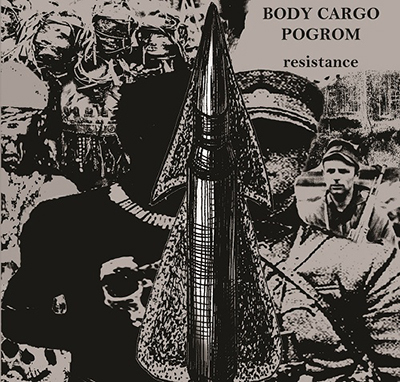 Resistance will appeal traditional power electronics fans who like a lo-fi delivery of traditional sounds. It’s a solid offering and both acts show potential but also have room for improvement.